Bryk, A. S., Gomez, L. M. & Grunow, A. (2011) Getting Ideas into Action: Building Networked Improvement Communities in Education. In M. Hallinan (ed.) Frontiers in Sociology of Education. Springer Publishing. Morris, A. K. & Hiebert, J. (2011) Creating Shared Instructional Products : An Alternative Approach to Improving Teaching. Educational Researcher 40 (5). 5-14. I have to be honest: I’m not really sure what Morris and Hiebert were actually writing about. They used the word “products” 89 times, without ever giving an example. These “instructional products” are supposed to guide teaching, help students “achieve specified learning goals,” and improve “performance.” Performance of what? Learning goals decided by whom? They do give a nod to context, saying that “it makes sense to study standardized instructional treatments across variable settings, examining the data to learn about the effects of the contextual variables in the settings.” What data will they examine? Usually I assume this means test scores. Do test scores accurately give a picture of contextual variables? I disagree with their statement that “when all participants are accountable, they are motivated even further to contribute to building products that help solve the problems.” How can you be motivated to contribute if you are told to ignore the way you think is right and just do the same way? Finally, they refer to “empirical tinkering” as a way for refining the design, but an accountability system where everyone is judged by the same standards doesn’t exactly foster tinkering. Bryk, Gomez, and Grunow, on the other hand, give real examples of the issues they are tackling: “ethnically based gaps in academic achievement, too many adolescents dropping out of high school, too few children learning to read proficiently, and very low student success rates in our community colleges.” Similar to Morris and Hiebert, they detail a restructuring of the education improvement system, but they instead organize around a problem in context, where as Morris and Hiebert look more generically at variation in practice and improvement over time. They also take an ecological approach rather than Morris and Heibert’s myopic focus on one, correct curriculum. As further contrast with Morris and Heibert, “Rather than thinking about a tool, routine or some other instructional resource as having proven effectiveness, improvement research directs efforts toward understanding how such artifacts can be adaptively integrated with efficacy into varied contexts, for different kinds of students, and for use by diverse faculty.” This incorporates variability into design, rather than designing to reduce it. Bryk, Gomez, and Grunow state, “Open networks abound in education. In the main, they function as free-floating idea bazaars, contexts for self-expression, and places to share information.” This in Pinterest/education. There are lots of voices and varying degrees of quality. 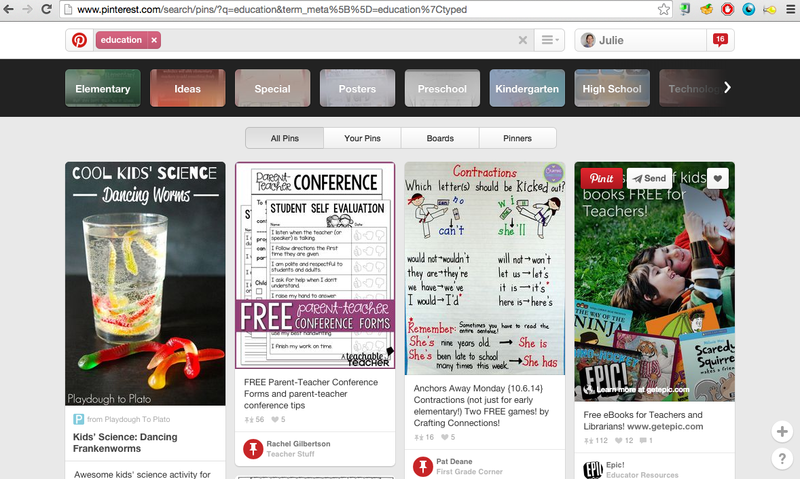 I will admit that I had a low opinion of using Pinterest for classroom ideas at first, thinking that it would be more Pinterest-like and be ideas for elaborate elementary school bulletin boards, cutesy field trip forms, or Olivia costume ideas. Those exist, but there are also some more transformation possibilities that take advantage of the visual aspect, such as pictures of innovative classrooms. I also found that links to something like Genius Hour ideas inspire thinking: What is a genius hour? What is passion-based learning? What would it look like for my students to choose what they learn? Pictures are powerful for piquing curiosity, but does it inspire the agency to bring it into your classroom? Pinterest is incredibly effective at tagging and sharing information, but it is not concerned with action. Edcamp is an interesting juxtaposition to Pinterst. In someways, edcamp is all action with little information. Educators show up in person, though often tweet throughout, and group informally based on day-of proposed topics. Group leaders might have no experience in the topic they propose, but they agree to facilitate the conversation. You can “vote with your feet,” i.e. if you think a topic is boring, you leave and go somewhere else. Conversations are highly variable and might be profoundly transformative or (more likely, in my experience) platonic echoes of what you already know.